Blue Mesa Reservoir is our home lake and is within an easy drive of Gunnison, Crested Butte, Montrose, Ouray, Telluride, Ridgeway, and Grand Junction. Trophy sized kokanee salmon, brown trout, rainbow trout, perch, suckers and lake trout all live in the deep waters of Blue Mesa and can be caught through the ice! On our trout trips we typically average 12 to 25 trout with a mix of rainbow and brown trout. Salmon fishing trips vary year to year with the population, but on an average year, we catch 10-20 salmon a day depending on how fast your reflexes are! Perch fishing gets better every year with 50+ fish days fairly common for a mix of sizes, but we are typically aiming to put 10-25 jumbo perch in the 9-12″ range on the ice! Lake trout trips are focused on either quantity or quality, but regardless, patience and focus are esential to capitalize on opportunites! 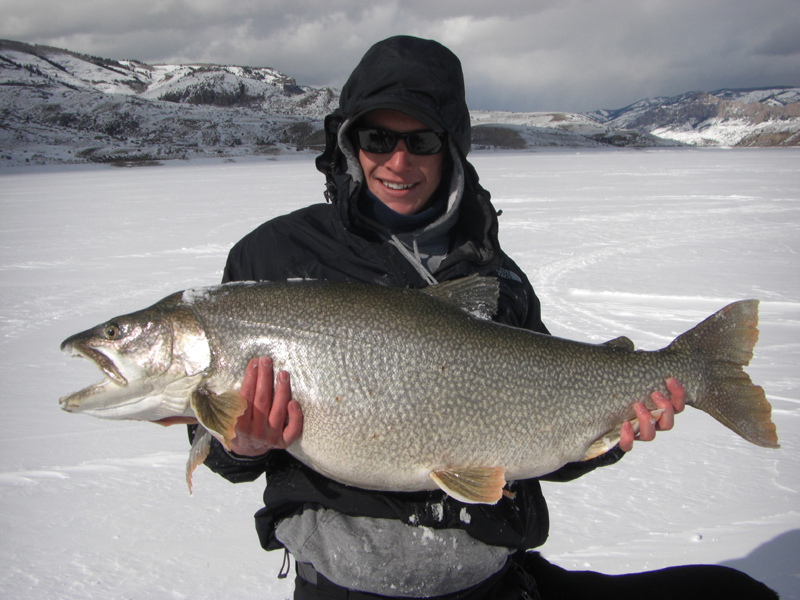 Blue Mesa is home to the state record lake trout of 50 lbs and we have had fish up to 36 lbs come through a 10″ ice hole! Blue Mesa Reservoir is the largest body of water in the state of Colorado. It is about three hours and twenty minutes from Colorado Springs and three hours and forty minutes from Denver in Currecanti National Park, which does not require a fee to enter. Blue Mesa is a truly unique reservoir with many different ice fishing opportunities surrounded by incredible landscapes such as the Dillon Pinnacles, West Elk Wilderness area, and the beginning of the Black Canyon of the Gunnison River! Safe ice begins to form in late November or early December around the inlet and the lake city bridge and then it works its way westward until the Iola, Cebolloa, and Sapinero basins are all frozen in late January. Historically, Blue Mesa has been one of the most productive kokanee salmon operations in the Western United States, but from 2007-2010 there was a somewhat mysterious decline in kokanee egg take numbers at the Roaring Judy Hatchery. This decline was blamed on 18-30” lake trout for their aggressive behavior and fast growth at this size, but it is quite possible that the perch, illegally introduced in the 90’s, are having a negative effect on the younger salmon. Despite, over 3 million salmon being stocked annually the population has been up and down and 2014 and 2015 have been two of the worst years in the last decade! Part of this may be due to the fact that the reservoir was down 50-70′ in 2012 and 2013. Low water years typically result in higher angling pressure and predation on the kokanee salmon. However, we have been seeing a lot of the younger year classes caught towards the tail end of the open water season in 2015, which is a good sign for the future!